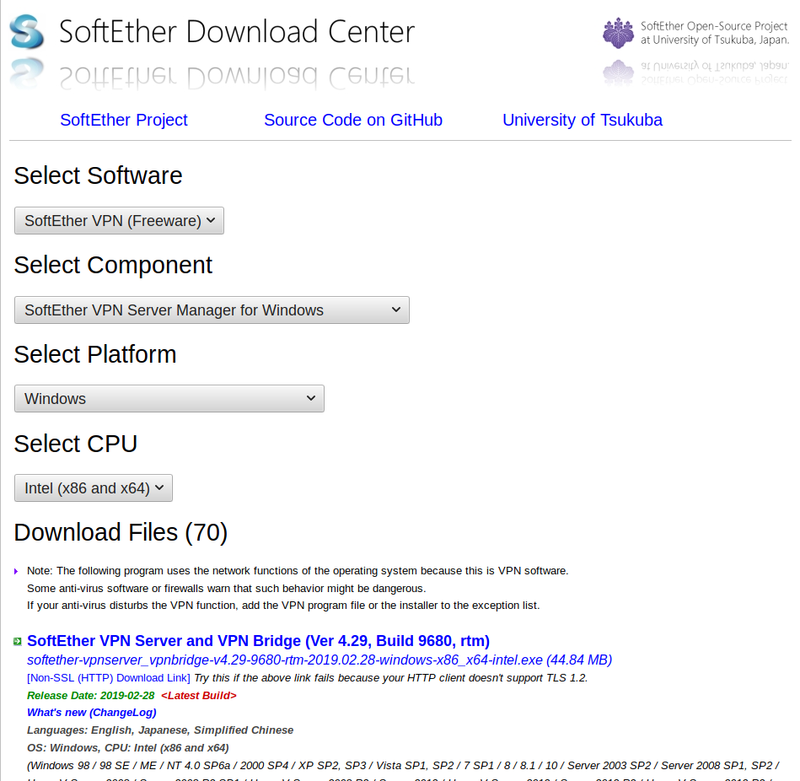 Here we will be installing Softether VPN server on Ubuntu/Debian. After this is done you will be able to use this server as a VPN node and optionally open/forward ports to static internal IP’s. 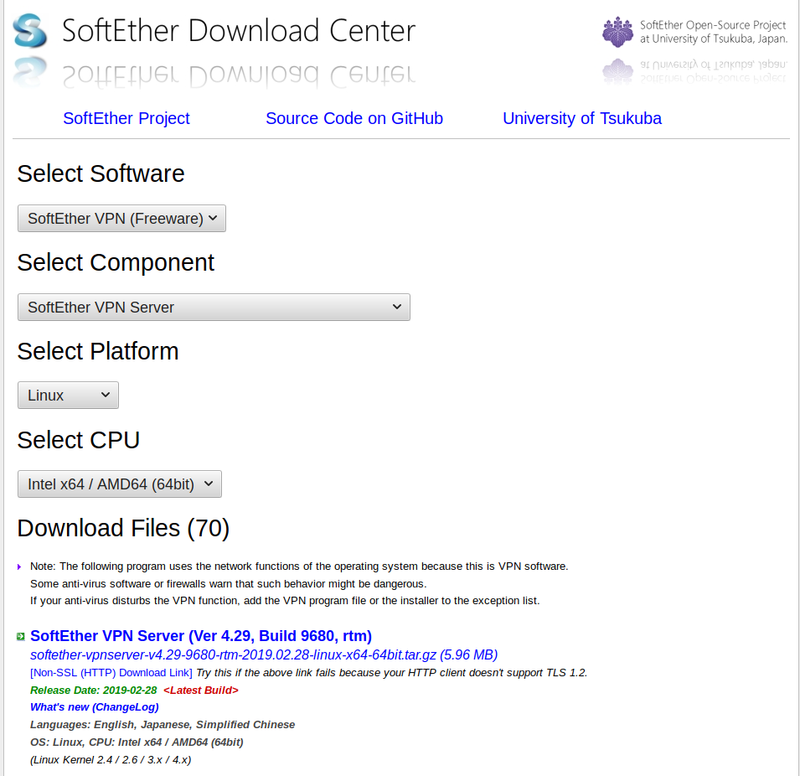 We now have a custom Softether VPN install script to make this easy to install on any Debian/Ubuntu VPS. See here for simple installation. Login to the server as root. Note the public IP and the network adapter. Note in the example below it is “ens18” and IP is “93.158.203.113”. This will be needed for later steps. Update the OS if not already done. Use wget to copy it directly onto the server. Enter the admin password twice to save. Then type exit to quit. Install it, run it, click New setting. Input ip and password. Name the VPS node. 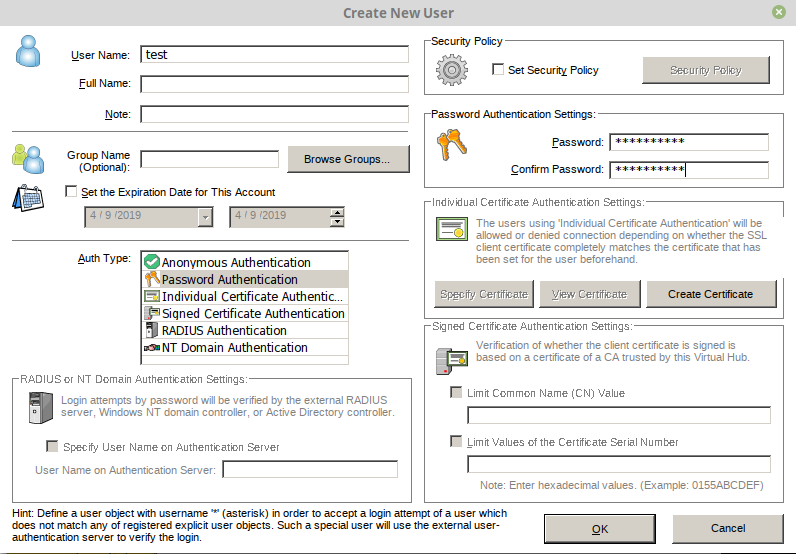 Fill in Public IP/or hostname and the admin password set earlier during installation. Connect to your newly created server. 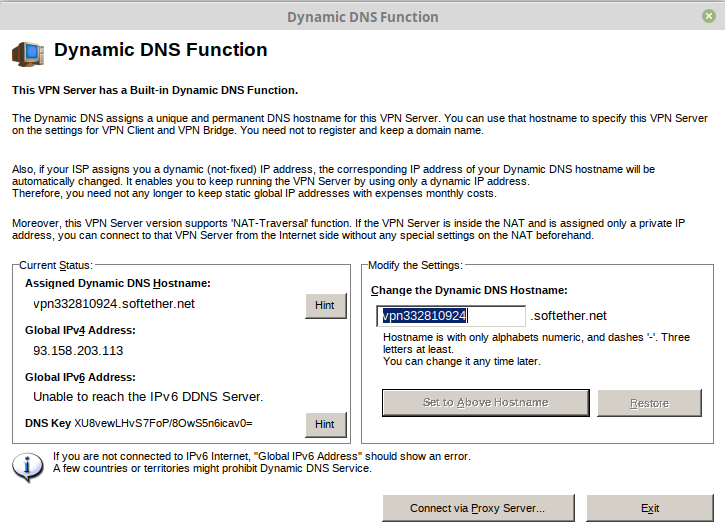 adjust the dynamic DNS name if desired. 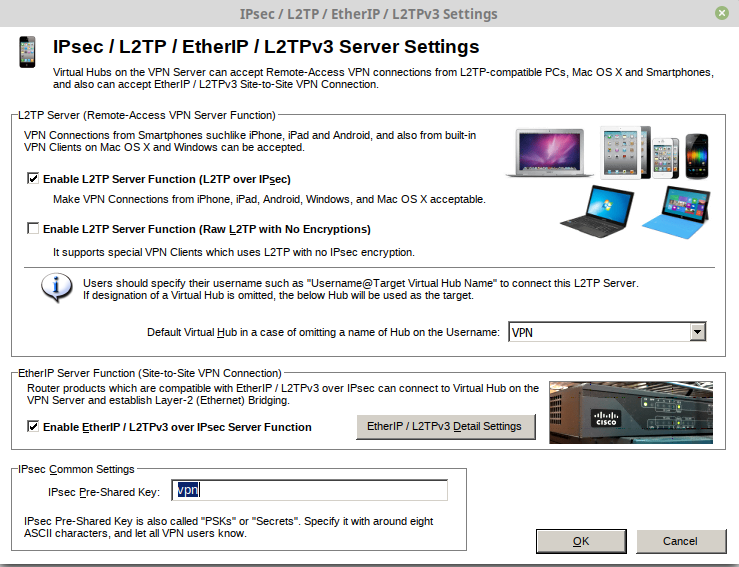 Enable L2TP Server function and IPsec preshared key as desired. 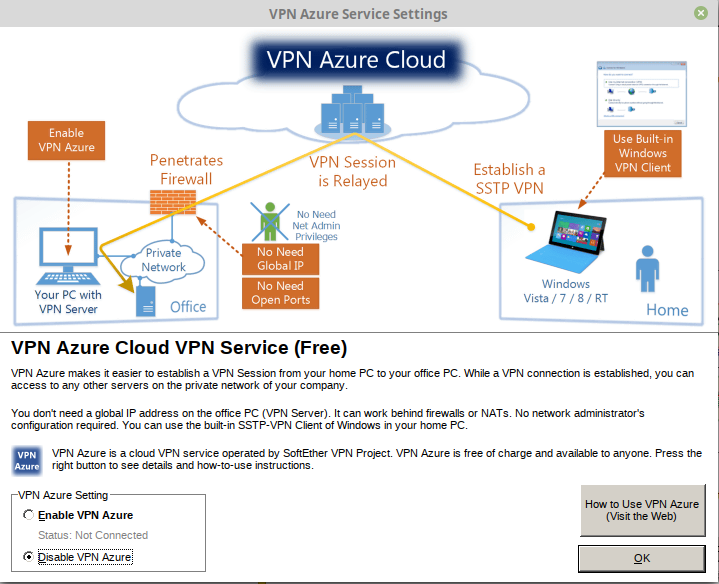 Disable VPN Azure mode if not using on Azure cloud. Select your Ethernet adapter and then click to create user. 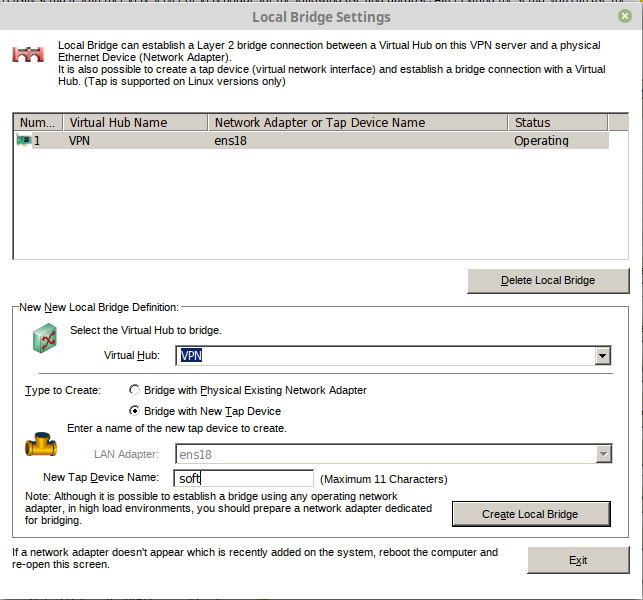 Create a tap device “soft” bridged to VPN HUB this ends up becoming “tap_soft” which is needed for later steps and click exit. Add port 443 as listening port for OpenVPN. This helps evade firewall blocks on some networks. 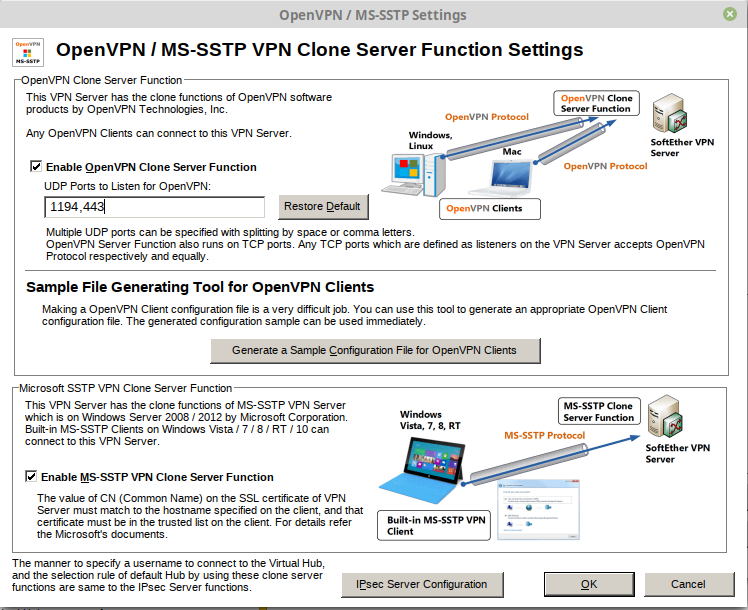 You can then download the Sample Configuration file if planning to use the VPN with an OpenVPN client. Can then click ok and exit the server manager. 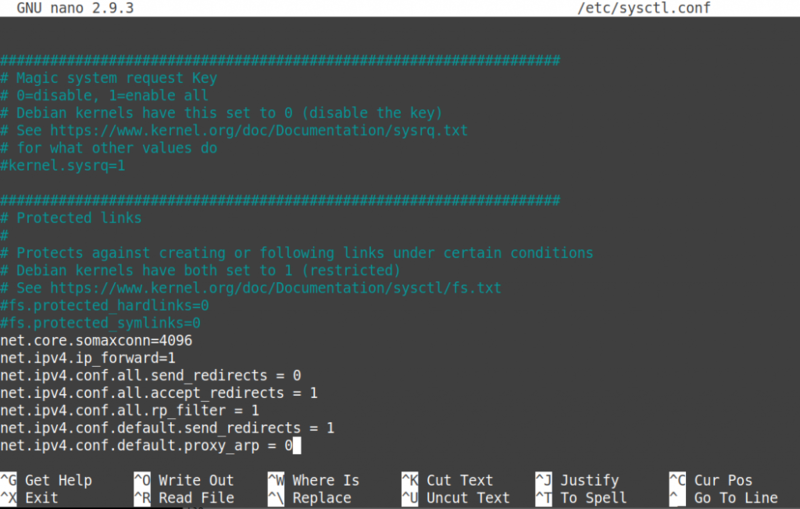 Create systemd init file for Softether VPN service. This will control start, stop, and restart Softether service IPtables and DNSmasq service. 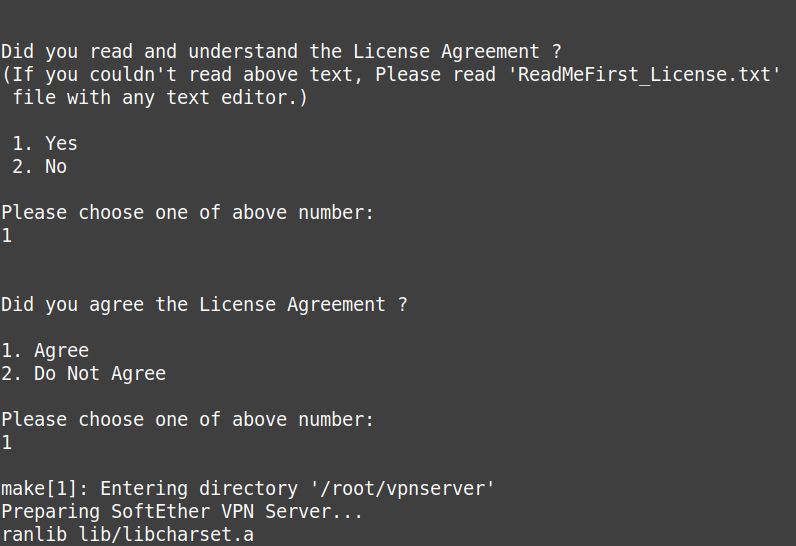 Setup Iptables by creating bash script to automate the iptables needed for VPN. Paste in the below code. 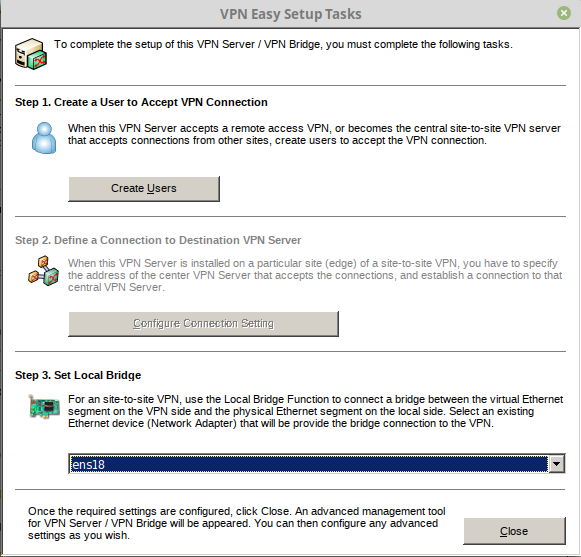 Make sure “NET_INTERFACE=ens18” matches your net interface and “VPNEXTERNALIP=93.158.203.113” has your public IPv4 instead of the example “93.158.203.113” noted from the beginning of the tutorial. TAP_INTERFACE=tap_soft                     # The name of your TAP interface. NET_INTERFACE=ens18                              # Your network adapter that connects you to the world.In OpenVZ this is venet0 for example. #IPV6_ADDR=2B00:1DA7:002B:0007:0000:0000:0000:0001      # You can also assign this as DNS server in dnsmasq config. VPNEXTERNALIP=93.158.203.113                  # Your machines external IPv4 address. # Write down you IP or one of the IP adresses if you have more than one. # Warning! NAT Machine users, here write the local IP address of your VPS instead of the external IP. # Forward all VPN traffic that comes from VPN_SUBNET through $NET_INTERFACE interface for outgoing packets. # Allow VPN Interface to access the whole world, back and forth. Install DNSmasq DHCP server. 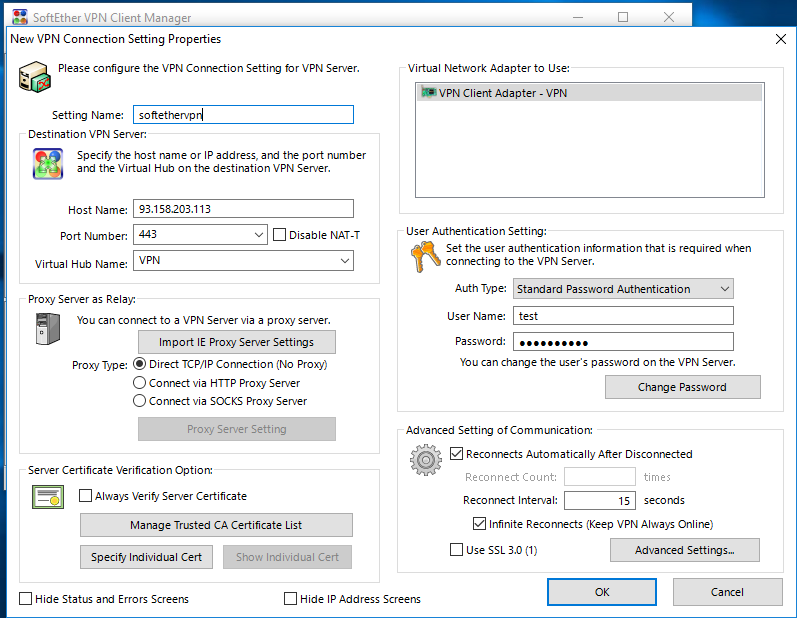 This is required for the tutorial and helps improve the speed over using the SecureNat/DHCP builtin function of Softether. This is also needed if wanting to open or forward ports and set internal static IP’s. Create new /etc/dnsmasq.conf. Make sure your Tap Adapter matches “interface=tap_soft” and Interface “except-interface=ens18”. If you have been following the rest of the tutorial the rest of the stuff is already setup to match network. # Let's assign a unique and real IPv6 address to all clients. # You should replace it with your own IP range. # Let's advertise ourself as a DNSSec server. # Since we're running in the VPN network this shouldn't be any problem. # Copy the DNSSEC Authenticated Data bit from upstream servers to downstream clients and cache it. # between dnsmasq and the upstream servers, and the trustworthiness of the upstream servers. # or addresses in the non-routed address space to the parent nameservers. # Set the maximum number of concurrent DNS queries. The default value is 150. Adjust to your needs. # So that everything runs through us. # This is good for caching and adblocking. # Can go up to 10k. # so it does not query for the same non-existent hostnames again and again. # This is probably useful for spam filters or MTA services. # in case these replies do not contain TTL information. # then dnsmasq will not cache the reply. # Additional hosts, for adblocking. # With settings below, you can ping other clients on your lan. Setup Sysctl for IPv4 and optional Ipv6 forwarding. Or alternatively this can be done manually via nano. 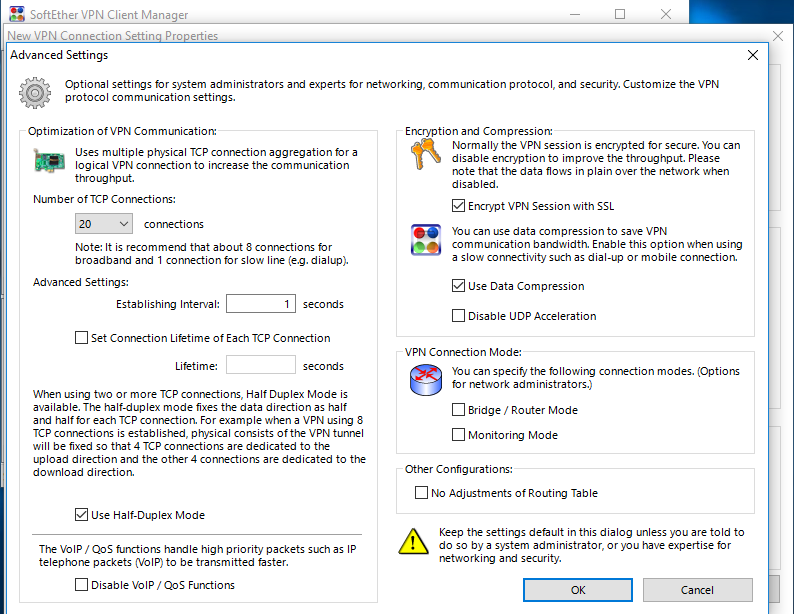 Paste in the below block for IPv4 and optionally IPv6 if setting up dualstack IPv6 VPN. net.ipv6.conf.tap_softether.accept_ra=2 # IF you named your tap interface other than softether, change this value. Run the below to apply the rules. A Reboot also may be required in some cases. Alright now for the fun part. We are going to enable and startup up the Softether VPN service we created earlier. To enable, start,and check status of the systemd dnsmasq dhcp service. Now the VPN server is working and should be accessible. 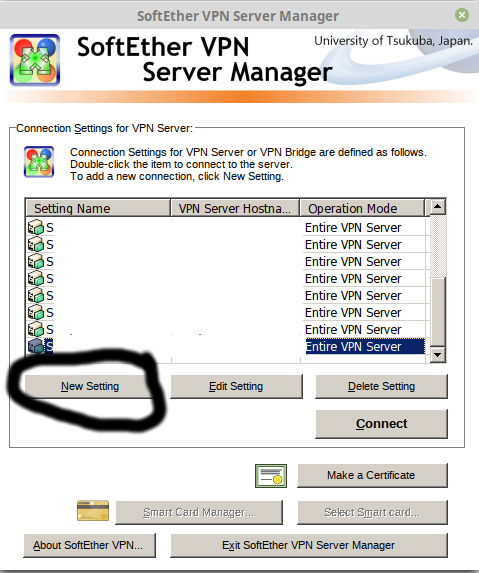 Please install SoftEther VPN client or your Openvpn client and connect at this time. 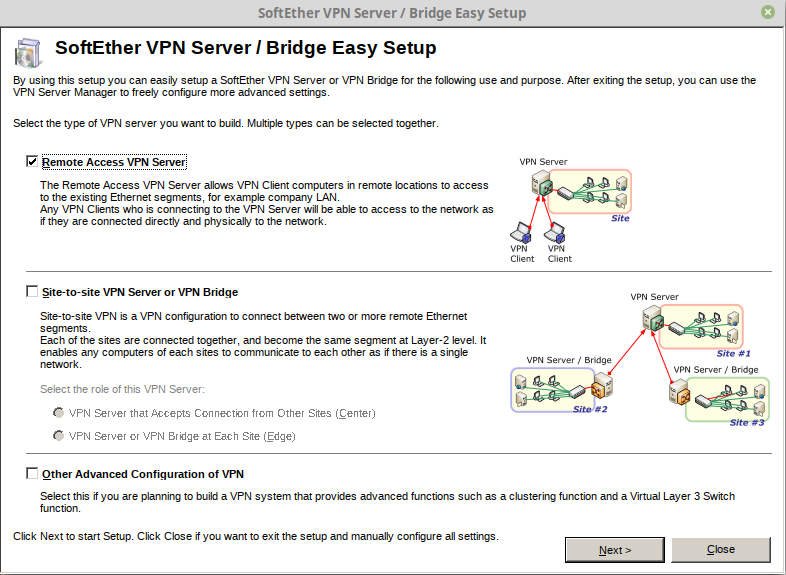 Grab the SoftEther VPN client installer from here. Install it create a new connection see the below recommended settings. 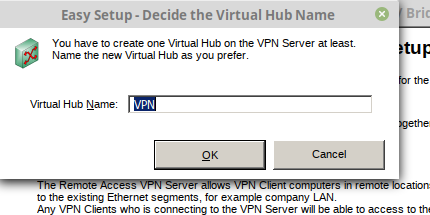 Replace the IP from our example with your VPN server’s IP and name it something and input the username and password from previous step. Now you have an adblocking Softether VPN Server setup which can be used from 6 protocols. To setup Softether to be logless see our other article about that here. So if the Mac Address is “5e:04:e5:79:e9:fa” and desired internal IP is “192.168.30.145” It would look like the below. 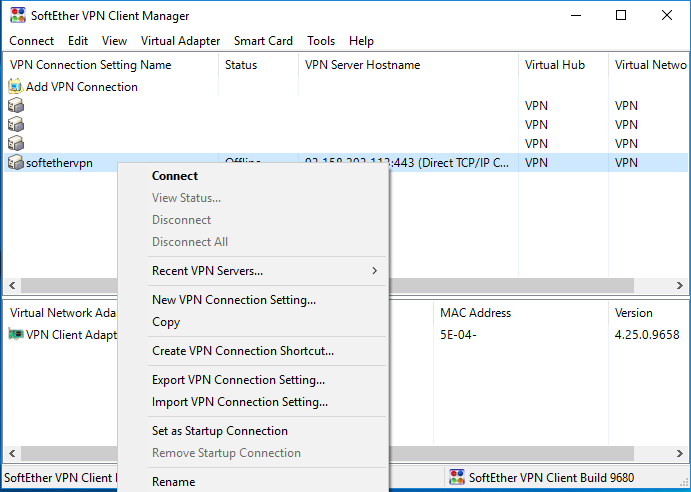 This Mac address is autogenerated by the VPN client in most cases and can be manually specified or changed in most OS’s. Once you have this assigned and saved. We need to reload the systemctl daemon via the below command sequence and restart the VPN service. Once that is done and you have connected again check to ensure its assigning this internal IP each time from this device. If that is good then we can move onto the next step which is opening the desired ports. 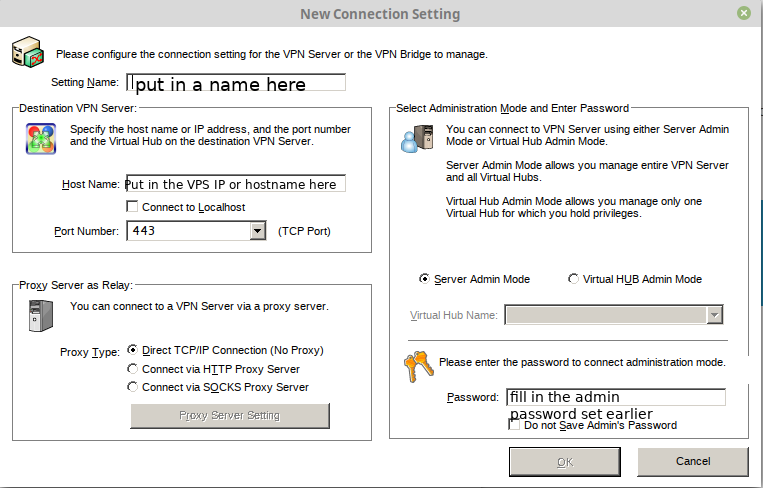 #Example "93.158.203.114" is VPN node IP. Port to forward is "2634". Client's static internal IP "192.168.30.145"
It will show that its forwarded in the Iptables like the below example if executed properly.